Eliminate odors with a fresh-smelling fog! The Clean Air Genie Auto Air Freshener will grant your wish for a clean-smelling interior! The name is apt because, with the push of a button, an air-freshening fog rises out of the Clean Air Genie and fills your vehicle with a fresh odor neutralizer. Like magic, foul smells and stale odors will disappear from your car's interior. The Clean Air Genie is a new air cleaning technology that doesn't just mask odors, it permanently eliminates them. If you've left wet clothes or towels on your backseat and mildew has set in, the Clean Air Genie gets rid of that smell forever. Did a smoker ride shotgun, The Clean Air Genie's penetrating fog will neutralize that stale smoke smell in the air and the seats. Your vehicle's interior will smell fresh, even if some of your passengers are not! Pet owners, you have to try the Clean Air Genie. Even if your pet has left an indelible scent inside your vehicle, the Genie will remove it in just one treatment. The Clean Air Genie's unique delivery system sets it apart from ordinary aerosol fresheners or scented cardboard cut-outs. The Genie releases a fog that fills up the entire interior. The process takes only five minutes but the results are long-lasting. This is a permanent solution to auto odors from the same company that makes Clean Air Everywhere and Clean Air Duct Treatment. Here's how the Genie works: Shake the can well and remove the lid. Set the can on the floor of your vehicle in the backseat. (It should be on a flat surface without anything directly above it.) Roll all the windows up. While keeping your face and body away from the fogger, press the button firmly and close all the doors. Go have a cup of coffee. By the time you get back, the fog will have dissipated (about 5 minutes). Open all the doors and let the vehicle ventilate for another 5 minutes. The scent is fresh and clean, but it will be strong initially. As the neutralizer scent fades, the interior will just smell clean, not perfumed. The Clean Air Genie releases a dry fog. You will not have damp seats or carpet. The Genie will not leave a film on the inside of your windows or mirrors. 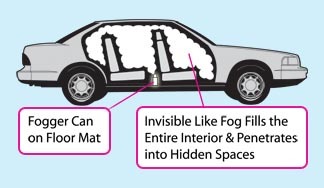 The fog is proven safe on all interior surfaces, fabrics, and materials. We received an initial care package of Clean Air Genies at the office for the staff to try and everyone raved about this stuff. There are a couple of dog lovers on staff who were particularly impressed with their new clean-smelling interiors. You won't be disappointed with the Clean Air Genie. While you're at it, spray your vehicle's air vents with Clean Air Duct Treatment for air/heat vents. This product goes into your vents where mildew odors can hide and eliminates them permanently. When you turn on your air conditioner, you'll smell only clean, fresh air. 1.5 oz. Federal regulations prohibit the shipment of aerosol products by air. This item is shipped by UPS Ground only.